During the International Builders Show (IBS) in booth #C2608, Kolbe will highlight its breadth of customizable options to create one-of-a-kind entrances. 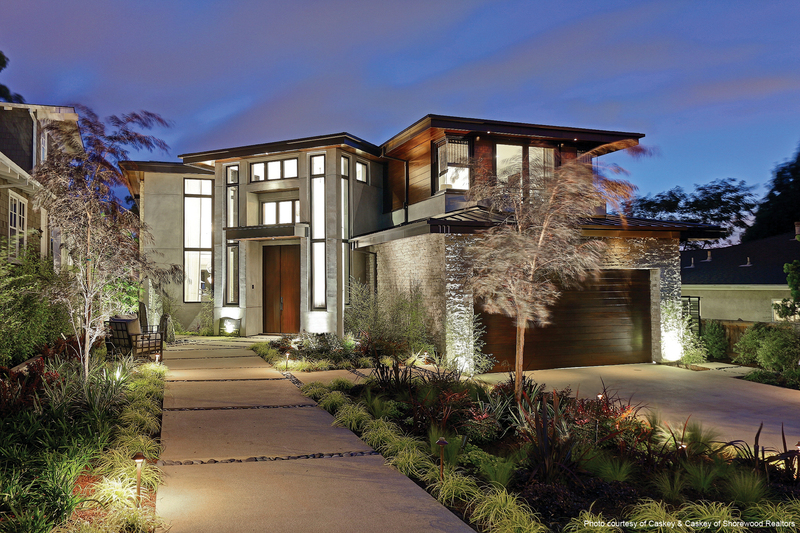 "Distinctive homes deserve a grand entrance. No other feature on a home makes such a powerful statement and lasting impression as the front entry," says Cindy Bremer, Kolbe's vice president of marketing. "With Kolbe, each entry is built-to-order so it can be individualized with wide and tall sizes, unusual shapes, rare wood species, bright and bold finishes, finely crafted glass, and many other selections." Helping inspire new ideas for the visionaries, Kolbe's IBS display will include several custom entries that draw visitors to the doorstep. A custom, Mahogany wood, pivot door with Rockwood® GeoMetek locking pull handle in Satin Stainless finish and energy efficient, tempered LoE²-270 reeded glass is the most anticipated, new example from Kolbe. Over 6 feet wide by 9 feet tall, the specialized pivoting hardware allows easy operation in spite of its large size. * Kolbe's Ultra Series exterior door delivers a stately appearance at 8 feet tall and 4 feet wide. The door's extruded aluminum exterior is distinguished with bull nose casing and finished in a Silverstorm mica coating. On its interior, Rift White Oak wood is stained to resemble barn boards. 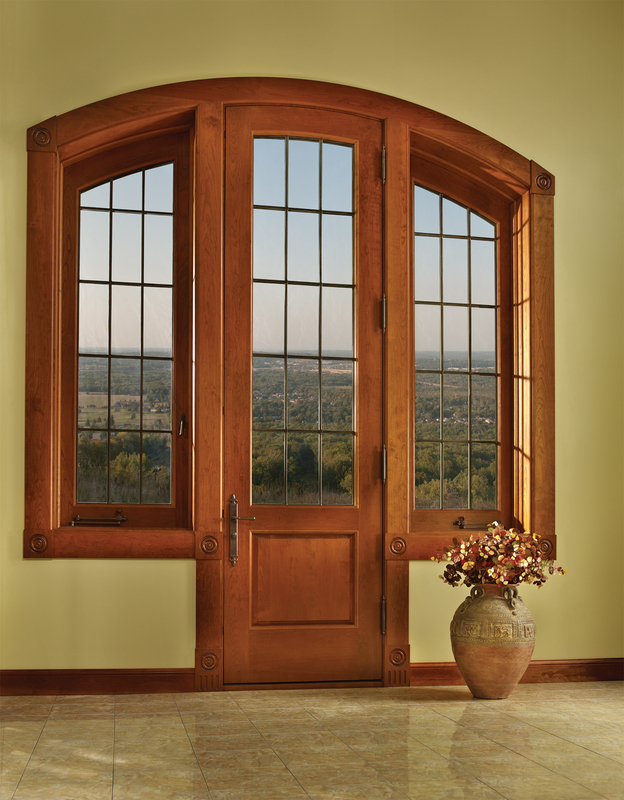 Insulated glass features a special pattern from Bendheim. The SOSS hinges practically are invisible for a neat, clean look complemented with a black Verona handle set. * Warm and welcoming, an inswing entrance door features Hickory planks with horizontal V-grooves on the interior and the exterior, complemented by an exterior aluminum frame finished in Coal Black. Matching sidelites have tempered LoE²-270 insulated glass with black spacers. The door's hardware is electronically activated with a multi-point locking system for easy, secure operation. It is appointed with a Dallas handle set in Matte Black, adjustable hinges, and a Dark Bronze anodized sill for enhanced durability. * Courtesy of Kolbe's subsidiary company, Point Five Windows & Doors, the grandeur of a copper-clad exterior entrance is enhanced by marbled black oxide patina, Sun Valley Bronze hardware and casement sidelites. The historically styled Bendheim Circa 1900 glass has applied lead divided lite bars in a colonial pattern. On the interior, Cherry wood is finished with Sikkens Dark Oak stain for a richly elegant effect. * Demonstrating the power of a strong impression, Kolbe's Ultra Series contemporary, inswing door is configured with asymmetrical panels that each contains four lites of frosted glass. 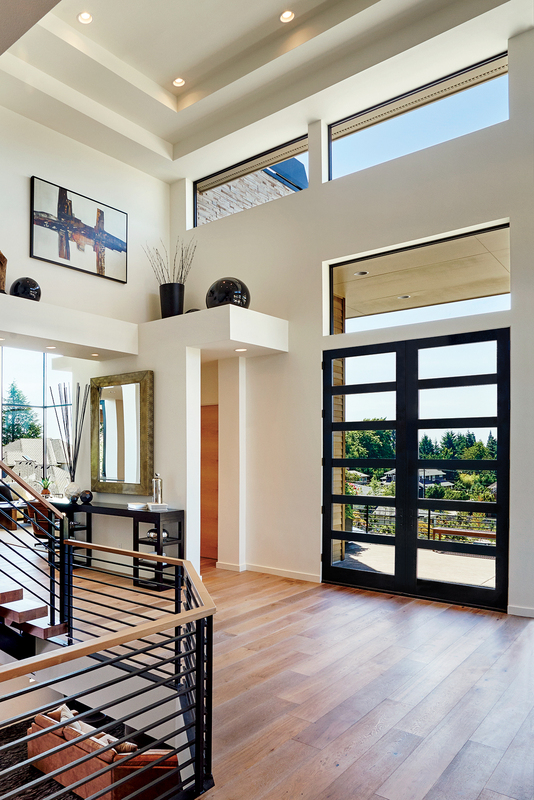 The main door panel provides regular entry, and when desired, the smaller panel also operates for an expansive opening. The door's extruded aluminum exterior is boldly finished with the door panels in a custom Fire Engine Red, framing in Coal Black and the White Oak wood interior in an Ebony stain. Satin Nickel, Dallas style hardware completes the striking look.